If we’re going to be brutally honest, the truth is that for nearly everything most people do with their cars, somewhere around 100 horsepower is more than enough. I know this is true because I do all kinds of normal car stuff with half that. But I also know horsepower is life-affirming and, as that clean lady says, sparks joy. It’s a big factor in a vast number of car purchases. And I think the way we currently rate it is broken. Luckily, there’s a good, relatively easy fix. The main number carmakers should be using when talking about how powerful cars are should not be horsepower, but rather wheel horsepower. Wheel horsepower (WHP), as most of you know, is the power rating taken at the wheels of the car, the point where all that power actually interacts with the real world. This is unlike current horsepower ratings, which measure horsepower of the engine itself, unconnected to the rest of the car’s drivetrain. While this is certainly useful information, in reality, it’s only going to be relevant if you’re planning on, say, buying a new Mustang and removing the engine to drive the pump for your sorghum well or log splitter or something. 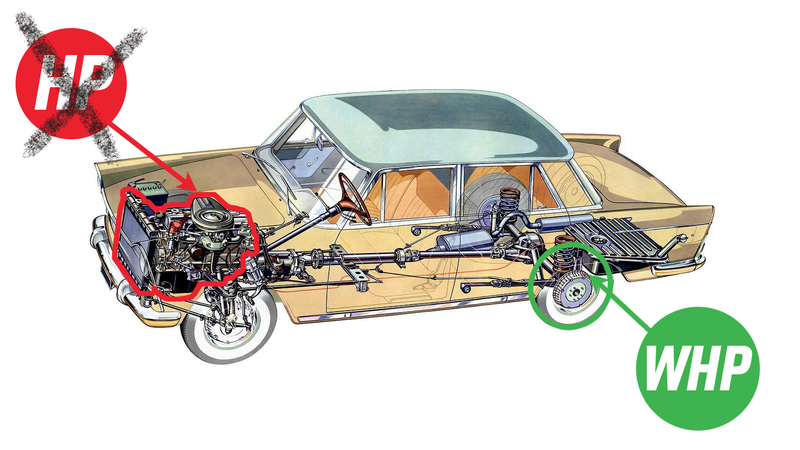 Most of us who buy cars prefer the engines in those cars are connected to a drivetrain that transfers that power from the crankshaft to the wheels, which are far easier to use to get around. So why do we insist on using numbers that are, really, deceptive for the real world? When you’re buying a car, if horsepower is a factor for you, you should be able to know what it is in actual, real world use. That means WHP. Sure, you could scour the internet for the WHP of the given car and drivetrain configuration you’re looking at, but that’s not always easy, if those numbers are even available, and, more importantly, why should you? The manufacturer should provide WHP numbers. Ideally, WHP would become the primary power figure you’d look at when buying a car, and if you wanted to dig further, you could get the normal horsepower rating and all that. Now, if you really, really want all the information, you’ll be looking at a lot more, of course: power-to-weight ratios, 0-60 times, aero numbers, and on and on. That’s not for everyone, which is why I just think all that really needs to happen is to make WHP the standard default HP number used for cars instead of crank HP. I know manufacturers may not like this for a few reasons. First, the WHP number will be smaller. That’s just physics. Drivetrains can take a 15 to 20 percent hit from the power numbers, and especially for cars like the Dodge Challenger Hellcat that base their whole identity on big-HP bragging rights, they’re not going to like to hear that instead of shouting 707 HP, they’ll have to tout somewhere around 630 WHP. It also means a little more work for carmakers, in that many cars have multiple drivetrain configurations (FWD, AWD, manual, auto, automated manual, whatever) and all those would need their own WHP rating. Wheel horsepower numbers can also be more difficult to hit consistently, since getting them involves running a car on a dyno and results can be affected by ambient conditions, temperature, and other things that are difficult to isolate. But, who cares? Let those lazy-asses do the work! The consumers have a right to know, and I suspect they’re already checking out those numbers, anyway. Buying a car is a big deal, and I believe consumers have a right to as much accurate information as they can stomach. This is a relatively easy change to make, and it gives the buyer more realistic information to work with. It’ll reveal what cars have more efficient drivetrains, and what cars are trying to hide more archaic driveline designs with big engine HP numbers. I can’t think of any reason why people wouldn’t want to know the most real-world focused specs they can get. That means switching from HP to WHP, so I suggest all you carmakers get right on this before I grow cross and give you detention. Demand WHP for your next car!